My long weekend has come to an end and my last adventure was exploring the Feather River Low Flow at White Gate. The road to White Gate wasn't as bad as it looked. My old Camry did pretty well despite some ups and downs of the road. I had originally planned to go to Paradise Lake but I opted out because it was suppose to be windy. I'm glad I didn't go. 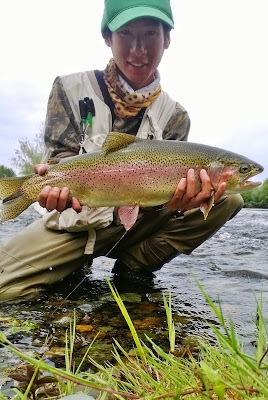 Mac from Fish First fly shop in Chico is a super cool dude for showing me some spots that were good for steelheading. It can be a challenge and downright dangerous to try and wade across a river where you don't know the depth. Mac showed me the place to cross and I did it with relative ease. Once I got to the other side I was met with a good riffle where I hooked two and landed one of the most beautiful steelhead I've caught so far. I didn't catch anything the rest of the day but I did explore some potential areas to fish in the future. I was met with some tricky wading, slippery rocks, swarming mosquitos, and awesome wildlife. The water was a really low 424 CFS at Gridley and areas that could have held steelhead didn't hold any, at least any that wanted to take my fly. 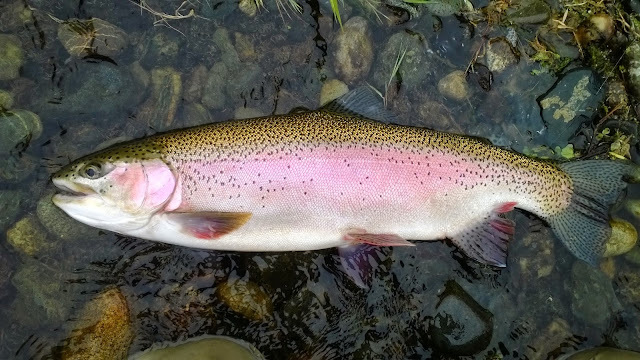 After I finished fishing the Wildlife Area I decided to go looking for a steelhead dinner. I fished around the hatchery and didn't catch anything. I hit the pools, run, and riffles but couldn't get into any fish. I was waiting for an evening caddis hatch but didn't see any fish rising despite the few bugs that were out. I'll have to figure out where and when the major hatches happen and catch them soon. Trout season opens this Saturday and Manda and I might hit up Deer Creek. She is sick right now but hopefully she gets better so she can catch a few.